Regiment/Catrawd: Motor Transport Army Service Corps then 12 Squadron Royal Air Force. Military Cemetery/Memorial / Fynwent milwrol: Arras Flying Service Memorial. Killed in Arial combat over Cambrai on Sunday 29 September 1918 aged 21 years. John Ledger Bromley was born in Rhyl, Flintshire, North Wales during 1897. John was educated at Rossall School, Fleetwood, Lancashire, where he held a Classical Scholarship and was reading Engineering. He enlisted with the Army service Corps (Ammunition Branch of the Motor Transport) on Monday 24 July 1916, at Great Scotland Yard, London. He was described as 19 years of age, 5’11”, 35″ Chest with a range of expansion of 3″, Fair Complexion, Perfect Vision and fit for Military Service. He served with the British Expeditionary Force in France and Flanders from Wednesday 20 September 1916 to June 1918. He then transferred to 12 Squadron Royal Air Force, completed the necessary flight training and was awarded his ‘Wings’ on Tuesday 17 September 1918. 12 days later on Sunday 29 September 1918 he was killed in arial combat. 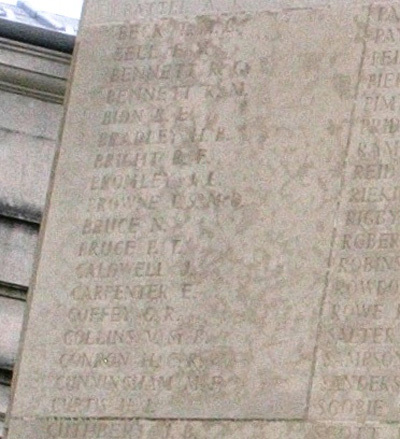 Photograph taken at Arras Flying Service Memorial, showing name of Private J.L. Bromley on the Memorial Wall. On 20 January 1919, a payment of £3.17s.6d was made by the War Office to his mother Edith Maud Bromley. This was followed by a further payment of £90.5s.6d on 5 March 1919, these being monies owed to John Ledger Bromley. The National Probate Calendar, London dated 12 January 1920 states that on his death he had left the sum of £331.1s.7d to his mother Edith Maud Bromley. North Wales Heroes Memorial Arch, Deiniol Road, Bangor, North Wales. There is a Flintshire Roll of Honour Card for John Ledger Bromley at the County Archives Office, Hawarden, Flintshire, which is undated and unsigned.